So I decided I wanted more bees. 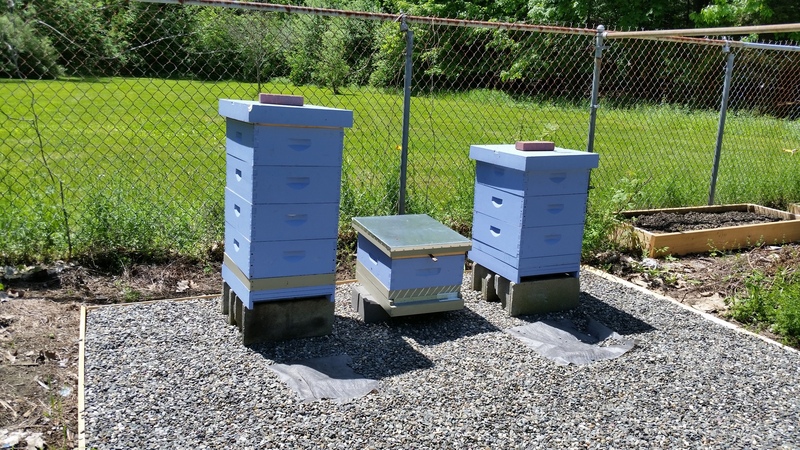 Rather than buying more this time, I figured I’d try splitting my existing hives and making a third, since those two made it through the winter and are both doing fine. In short, when you split you take bees and a few frames from a strong, existing hive and put them in new boxes. 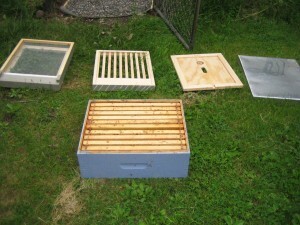 There are lots of different ways to do it (as usual, in beekeeping) and different ways to get a queen in the new hive. I did what’s sometimes called a walkaway split. I first needed to make sure I had all the components for a new hive ready to go, of course. 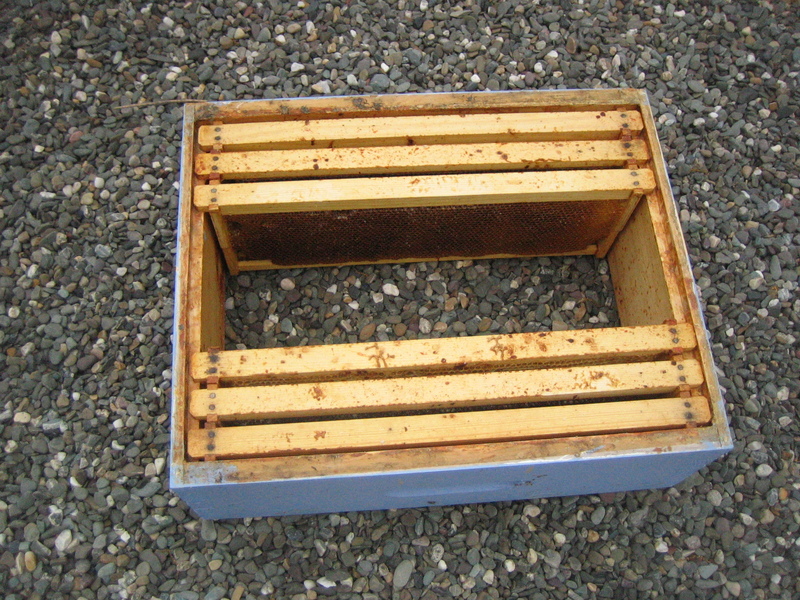 The new hive should have at least one frame of honey and one of pollen, so they have some food stores to start with. I had some left over from last year, so I put those in. Done. Now to go through the hives to find the best frames to move. I wanted a couple of frames of capped brood, to ensure that the new hive will have a bunch of new baby bees shortly. I also wanted a frame with eggs and larvae. With this type of split, you don’t add a queen to the new hive. By taking bees and frames and putting them in a new hive without a queen, the bees will realize they’ve suddenly become queenless and start raising their own from the larvae you provide them. If you add a new queen yourself, you first need find the queen in the existing hive, to make sure you don’t accidentally move her to the new one. If you do, then try adding a new queen, the bees will just kill the newcomer. By doing a walkaway, you don’t need to worry about finding the existing queen first (which is never easy). One hive or the other will end up with the existing queen (assuming you don’t squish her when you’re moving frames around), and the other one will then raise their own queen (providing you make sure there are larvae in each hive). To the question of the bees simply flying back to their old hive: Bees change roles in the colony as they age. They start out cleaning and regulating hive temperature, then change to caring for the eggs and larvae, then hive maintenance, guard duty, and finally foragers. Until they begin to forage (or possibly when they’re on guard duty), the bees don’t actually leave the hive for long, if at all, so they won’t have taken the time to orient themselves and learn to recognize their own hive. It’s only the foragers that will fly back to their old hive when you make the split. When you move the frames of brood, you want to make sure the frames are covered in bees and move those as well. Those will probably mostly nurse bees, taking care of the babies. They’ve never left the hive, so they won’t know that they’re in a different place. When they finally become foragers, they’ll just orient themselves to the new hive as if they’ve always been there. I actually painted stripes above the entrance on this one to help the bees get their bearings. Honeybees are really good at recognizing patterns, so the stripes might help them orient to their hive more easily. 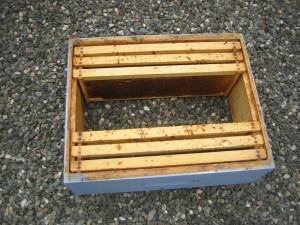 You can also see in the photo below that I’ve put an entrance reducer on the new hive. When colonies are weak, they’re more susceptible to being robbed. Having a smaller entrance to defend should help them out. It will be a while before I know if the split was successful. I’ll check in a few weeks to see if there are new eggs, which will mean there’s a new, laying queen. It may even be a while until I see bees coming and going, since it will take some time for the existing bees to become foragers. Now it’s just a waiting game. There’s a video of the whole process here. Neat video! Wish we could be there to see these processes in person. Bees are so interesting. Me too! Hopefully you can be here sometime when I extract the honey.